Curry (Ch Coleraine’s Mandalay Royalty) took Back to Back Group 1’s in a well supported Glen weekend. The first time a Glen of Imaal Terrier has achieved such a thing. Many congratulations! 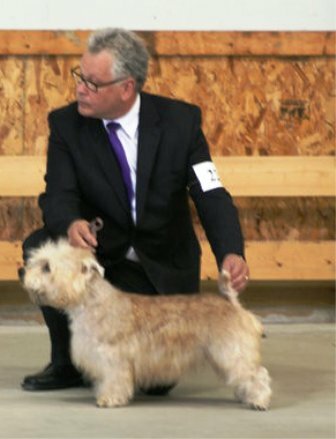 This entry was posted in Dog Shows, General Glen Things and tagged Ch Coleraine's Mandalay Royalty, Glen of Imaal Terrier by E-F-G. Bookmark the permalink. Curry’s sire is CH Malsville Soldier Blue and her breeder is Maura High.